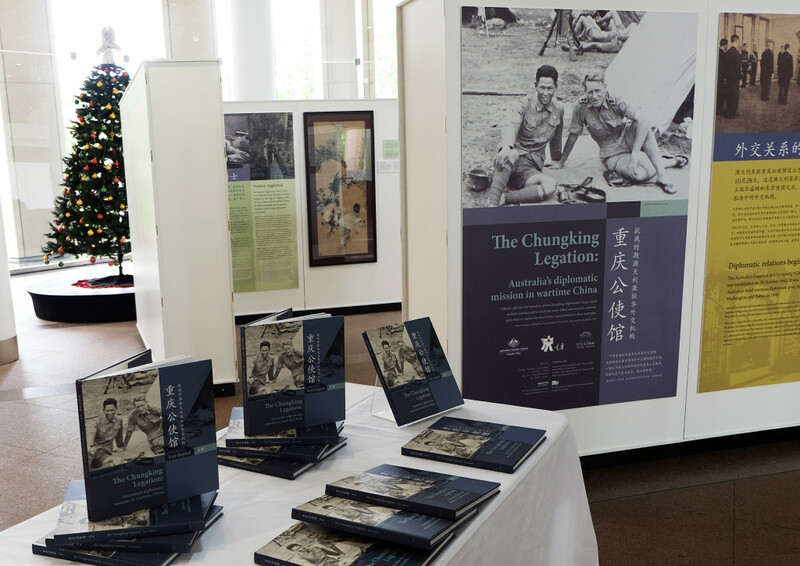 Over 2015 I have been working with the Chinese Museum in Melbourne and the Australian Consulate-General in Chengdu, China, on an exhibition and book titled The Chungking Legation: Australia’s Diplomatic Mission in Wartime China. They tell the story of Australia’s third overseas legation, which operated in Chungking (Chongqing) between 1941 and 1946. The Australian version of the exhibition and the book were launched on 7 December 2015 at the Department of Foreign Affairs and Trade in Canberra. 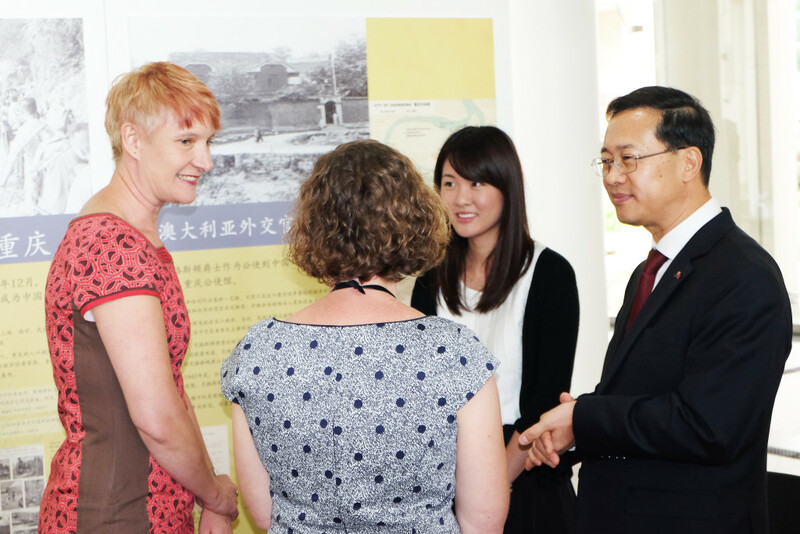 We initially developed the exhibition for display in China and it was launched there in March 2015 by Australia’s Governor-General, Sir Peter Cosgrove. 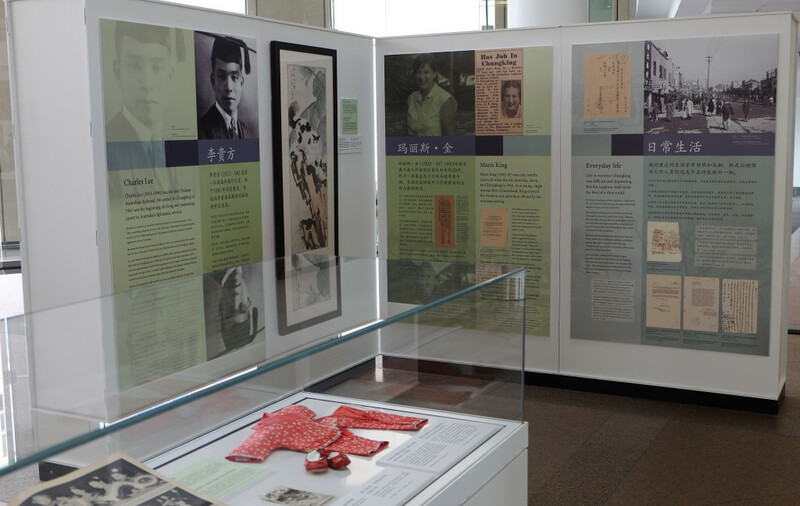 After first being displayed in the Old Australian Legation Building in Chongqing, the exhibition has since been on show at the Chongqing Intercontinental Hotel, the Chongqing Municipal Library and the Three Gorges Museum in Chongqing. I spoke at the Canberra launch, following speeches by the Secretary of DFAT, Peter Varghese, and the Chinese Ambassador, Ma Zhaoxu. Here’s what I said. The tie between the youngest and oldest nations of the Pacific was a great contribution to the united democratic front without which human decency and world order could never be achieved. In due course, Sir Frederic Eggleston embarked for Chungking and his Chinese counterpart, Dr Hsu Mo, arrived to head the new Chinese Legation in Canberra. The Australian press reported on these events with some interest. Indeed, they were quite fascinated by the Chinese Legation party of 23 who arrived in Australia in September 1941. Ten children and six women were among their number, including three women who were university graduates – intelligent, educated, sophisticated women emblematic of a modern China. The Australian press was also interested in the practical logistics of setting up a diplomatic mission in a war-torn country occupied by a common enemy. Chungking was cut off from its usual transport routes to the east, the only land route being the notorious and dangerous Burma Road. Officers in the Department of External Affairs had to consider every possible aspect of Legation work and life as they made arrangements – from finding suitable office space and living quarters to transporting office equipment, personal luggage, provisions and household commodities, even vehicles. These mundane arrangements had to be sorted out before any real diplomatic work could begin. As one newspaper headline plainly stated: ‘Minister to take food with him – must find house in Chinese capital, then furnish it’. Suitable staff to accompany Sir Frederic was another question. The government decided it would be unfair to ask an ‘Australian girl’ to go to ‘much-bombed Chungking’ as a typist, no matter what salary was offered. ‘It [was] no job for a woman,’ they said. But as you will see when you look around the exhibition, this line didn’t hold for long and women, both Australian and Chinese, took on roles in the Chungking Legation. In the exhibition we feature Maris King, who was plucked from the departmental typing pool in 1943 and went on to have a notable diplomatic career. Other women we know who worked in the Legation during those early years were Sylvia Westwood, Alison Waller and Rosemarie Hsia. One little girl, Lynne Westwood, age 7, also lived at the Legation, although a later Chancery report, from 1945, noted that ‘Chungking is not a place to bring young children to’. One of the joys in researching this exhibition and book has been glimpsing into the everyday lives of the Legation staff and learning something of the extraordinary conditions under which they worked. The Legation records, held by the National Archives, document the Australians’ diplomatic work at the highest levels – in fostering good relationships with Chinese leaders like Chiang Kai-shek and K.C. Wu, for example. But they also reveal the everyday bread-and-butter work of the Legation – issuing permits for travel to Australia, writing despatches, negotiating trade arrangements, and assisting Australians in distress, including those who had been interned by the Japanese. The Australians were well-known and liked in Chungking, on good terms with Chinese government officials and other foreign representatives alike. Reading through the archives and listening to the wonderful collection of oral histories held by the National Library, you get a real sense of who the Australians were, and what they brought to the remarkably cosmopolitan life of wartime Chungking. In true Australian style, for example, they referred to their distinguished Minister as ‘The Egg’. The personalities and personal histories of the Australians in Chungking meant they didn’t always get on with each other (and there were some real clashes), but these same characteristics made the Australians a unique bunch – from Eggleston’s intellect and integrity to Charles Lee’s easy friendships within all ranks of the Chinese government to Maris King’s sense of adventure and lust for life. 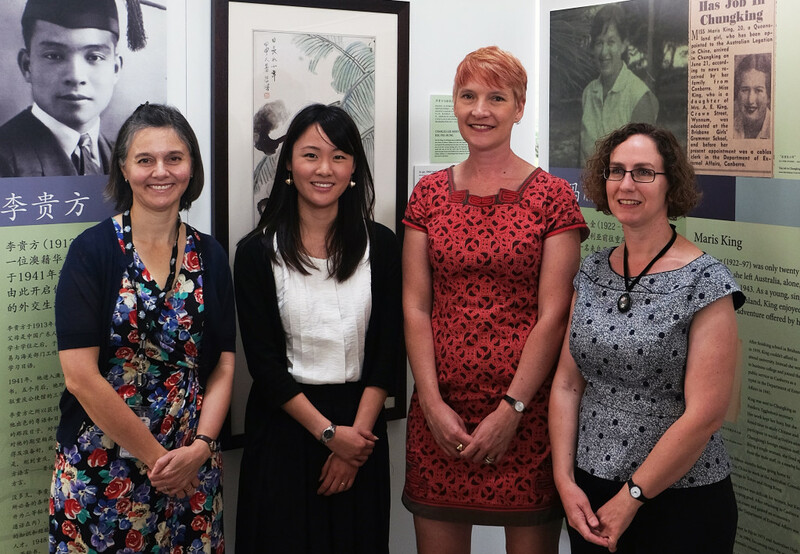 And so, just as the Legation’s work was a team effort, I’d like to finish by thanking the team I’ve worked with in developing the exhibition and book, particularly Nancy Gordon and Brodie Burns-Williamson and the staff in the Australian Consulate in Chengdu, and Jean Chen and Sophie Couchman from the Chinese Museum in Melbourne. In 1941, on his appointment as Minister to China, Sir Frederic stated that ‘it would be no small task to interpret Chinese culture to Australia and Australian culture to China’. Seven decades later things have changed somewhat, but I trust that the work we’ve done together on the exhibition, and the work we do separately as diplomats, consular staff, curators and historians, continues to strengthen the relationship between Australia and China and continues to build on our sense of mutual understanding. 1941 ‘AUSTRALIAN MINISTER FOR CHINA.’, Northern Star (Lismore, NSW : 1876 – 1954), 14 May, p. 5, viewed 2 December, 2015, http://nla.gov.au/nla.news-article98600046. 1941 ‘FROM CHUNGKING.’, The Sydney Morning Herald (NSW : 1842 – 1954), 15 September, p. 4, viewed 2 December, 2015, http://nla.gov.au/nla.news-article17741783. 1941 ‘MINISTER TO TAKE FOOD WITH HIM’, Examiner (Launceston, Tas. : 1900 – 1954), 10 July, p. 1. (LATE NEWS EDITION), viewed 02 Dec 2015, http://nla.gov.au/nla.news-article52455150. 1941 ‘TOO DANGEROUS!’, The Mercury (Hobart, Tas. : 1860 – 1954), 10 July, p. 3. , viewed 02 Dec 2015, http://nla.gov.au/nla.news-article25870604. 1941 ‘SIR F. EGGLESTON’, The Canberra Times (ACT : 1926 – 1995), 8 July, p. 2. , viewed 02 Dec 2015, http://nla.gov.au/nla.news-article2593999. I am enjoying your remarks, given today at the Chungking Legation exhibition launch.